Note: There are spoilers here. So beware. Characters Involved: Tim and Ruby. Enter Tim and Ruby's bedroom at a time when Tim is there (around 8AM is probably the best time.) Tim will give you a new hoe in this scene, one he got in a country far away. You have to be friends with both Tim and Ruby for it to work. Enter the kitchen at a time when Ruby's in there. (She's generally in there during the morning and mid to late evening.) She will ask you if you enjoy cooking. Say that you do, and she'll give you a special spice set she got in a country far to the south. You'll need it to make certain recipes. You must be friends with both Tim and Ruby for this to work. Become good friends with Gustafa, and enter his house at a time when he's there. (It seems like 10AM might be the best time.) He will give you a new sickle in the cutscene. He found it on the beach, and has no use for it whatsoever, so he gives it to you. This scene can only happen in chapters 2 through 6. Become good friends with Hardy, and enter the clinic at a time when he's there. He will give you this sickle in a scene, after warning you to be careful with it. You could lose an eye with that thing! Characters Involved: Romana and Sebastian. 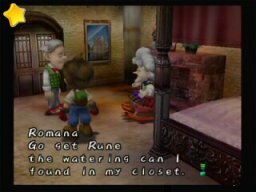 Become friends with Romana, and enter her room in the mansion at a time when she's there. She'll give you a new watering can in this scene. It is meant for trees and can only hold enough water for one small square of land. Become good friends with Wally, and enter his house while he's there. He'll give you a pair of shears in this scene. Why he had these in the first place is a mystery to me... He obviously knew he would have no use for them, so why did Wally keep them up till now?! Befriend Cody and enter his house at a time when he's there. (Morning might be a good time.) He'll have a piece of artwork to put up in your house. You can have it put in either your bedroom or the living room. This scene won't occur before chapter 4. Enter Grant's house at a time he's there. This may be a bit difficult, considering he's usually out working, but he's usually home at around 5AM each day and on the 10th of every season. He'll tell you that he has an old alarm clock that he doesn't need anymore, so he'll give it to you. You both will go to your home and set up the clock. From now on, you'll be able to set a time for you to wake up each day. This will only happen during chapter 2. If you're very close with your child, you maybe able to give him a bath if you enter the kitchen around 6PM. This won't work every day. Characters Involved: You and your son. Some time during chapter 3 (often on the first day) you'll get this scene if you enter your child's room while he's in there. He will have found either a wooden box or stick of some sort, and asks you if you think it's cool. Characters Involved: You, your son, Daachan. This will only happen during chapter 4. Try to enter your child's room sometime after 9PM. You may get this scene. (It doesn't work every day though.) Daachan, for some odd reason, is up and moving while your son is resting on the floor... Daachan will suddenly sit down, while your son gets up and orders you out of his room. This will only happen some time in Summer, Fall, or Winter in chapter 5. Enter your bedroom from your child's room at a time when your wife is not in your bedroom. Your son will have something very important to discuss with you. He's fallen in love with one of the local girls, and needs your advice. If you're married to Nami, she will come into the room while you're talking and give her own thoughts on the matter, too. One day during Summer, Fall, or Winter of chapter 6, your son will ask if you're going to take a bath or not. Say yes, and he'll offer to wash your back for you. It's during this scene that your son remembers how much fun he had when you bathed him as a toddler... and gets rather depressed to see how old you've gotten and how he is now bigger and stronger than you ever were. Become good friends with Griffin, and every once in a while you might get this scene in which Griffin plays his guitar in the bar. It seems that if you enter the bar right after Rock, your chances of getting this scene are greater. Enter the Inner Inn at a time Van is there (usually just before noon on the 3rd and 8th of the season). You'll see Van talking with a disgruntled Tim about the new "Matkins" diet Romana recommended to him. 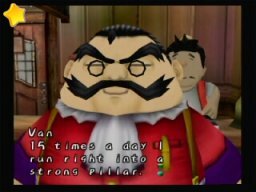 It seems that after trying whatever ridiculous activity Matkins had him do, Van lost an absurd amount of weight in a very small amount of time...or at least according to the scale they gave him. Notice the pun yet? Hehe. You can either congratulate him or tell him that the scale was wrong. This event may happen several times, the results becoming more and more ludicrous each time. You don't need to be friends with Sebastian in order to activate this event. Enter Sebastian's room at a time he's in there. You'll automatically notice a photo on his desk, and Sebastian will approach you about it, asking who you think the young woman in the picture is. You'll have to choose between three choices. Tell him you think it's a young Romana, and he'll tell you you're correct. Characters Involved: You, Lumina, Rock (if you choose option 2), Romana. This can only happen during chapter 1. Enter the mansion at a time when Lumina is playing the piano. 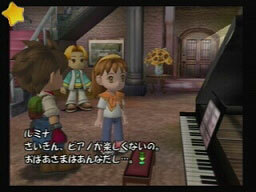 (You can tell when she's playing because you can hear the piano music from outside the mansion.) Lumina admits that she's not having much fun with the piano anymore, because she feels that she's not living up to her grandmother's expectations. You can either tell her to keep trying to please her grandmother, or that she should just play for fun and not mind what others say. If you tell her to please her grandmother, Lumina will get upset and Rock will step in and comfort her. If you tell her to play for fun, Rock will get upset and leave but Lumina will be happy. Characters Involved: Samantha and Chris. Sometime during chapter 2, go into the clinic and exit on a sunny day, when both Samantha and Chris are out and about. 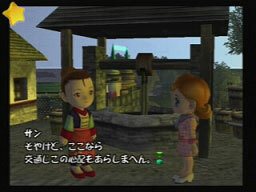 You'll get this scene, in which the two women meet outside of the well in front of their homes and talk about their families. Characters Involved: Daryl and Mukumuku. Characters Involved: Daryl, Murrey. Possibly Van and Mukumuku. This scene may happen as early as the day after Scientific Study 1. Exit your house around 7PM, and you'll witness Daryl's first attempt to catch Mukumuku. He's decided to lure Mukumuku to his lab by laying out bait... 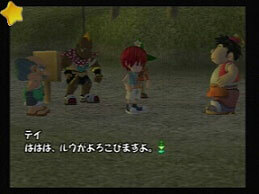 However, Murrey comes and takes all the bait that was meant for Mukumuku! Sometimes Van and Mukumuku will come up and help Murrey take the food away, but they generally run off before Daryl notices what's going on. This scene will happen shortly after Scientific Study 2. Exit your house around 7PM. This scene will be almost exactly the same as Scientific Stufy 2, only Daryl has decided to use raw elements of food (vegetables, fish, etc.) instead of cooked food. However, Murrey foils him again by taking the bait. You'd think he would have learned his lesson by now, right? Well, this scene, which will likely take place early in chapter 2, proves that Daryl has not learned from his previous attempts. 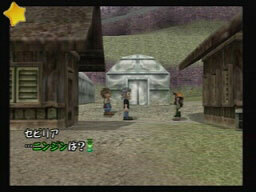 Once again, exit your house (just about any time of day is good) and witness Daryl's third attempt to catch Mukumuku. Once again, his plan is foiled by Murrey, who has now come to associate Daryl with a nice food supply! You walk into Daryl's lab and Daryl is mumbling and laughing to himself about a project. You walk up behind him and he turns around quickly in surprise with his usual bloodshot eyes and looking dirty as ever. He asks you what you want. You can answer either (1) "Nothing" or (2) "What are you doing?" Choose Option 2 and he goes into explaining how he's trying to making a Power Plant because he's trying to harness lightning, claiming that one bolt of lightning could give the town electricty for a year. He tells you that you're lucky that you get to see the first trail run and turns around to start it up. You have a worried look on your face as it starts up and then with a couple of flashes on the screen, everything goes dark. Daryl explains it just the breaker while the lights are off and says he has to go replace the circuit. The lights come on and he claims it needs more work. It cuts to you having a worried expression again and a squiggle in a text box. End scene with you leaving the house. Characters Involved: Daryl, Flora, Carter. We could have a whole section listing just the cutscenes involving Daryl, couldn't we? Anyway, exit the ruins at around 5PM, at any time during chapter 2. Carter will thank you for doing work, then Flora will come up and meet you. You'll walk off, and Carter and Flora will start talking to each other about trivial matters. On the other side of the river, Daryl is watching them, muttering to himself about how lucky Carter is to live with Flora. Flora will eventually spot him, and Daryl will freak out and run away. Characters Involved: Nic, Nak, Flak, Takakura. Two requirements for this scene: it must be no earlier than Summer of chapter 1, and you must have a girl up to three hearts. The scene can be triggered at any place in the valley, so keep a look out for it! The Harvest Sprites will call to you and say that they have something to show you. It's a Blue Feather! Nic and Nak are fighting over it, thinking that one of them should keep it. Problem is, both of them want it, and they can't come to an agreement! Flak is sick of their arguing and announces that he's going to give it to you. He snatches the feather and goes to put it in your toolshed while Nic and Nak protest loudly. Once Flak comes back, you all go back to your farm together. Flak asks you if you're always together with the person you love, and you'll automatically say no. Nic and Nak are surprised at this and decide it's best for you to have the Blue Feather. They rush back to their treehouse, each one claiming that he'll be the one to give it to you, while Flak chases after them telling them that he already gave it to you! 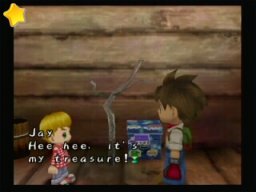 Just then Takakura comes up, having noticed the Blue Feather in the toolshed, and tells you more about it, including what it's for. Characters Involved: You, Griffin, Patrick, Gustafa, Cody, Carter, Tim, Nami. This scene can only happen during chapter 2, and only if you're married to a girl other than Nami. Remember during the wedding scene, when Nami left the inn? Well, if you enter the bar after Patrick, Gustafa and Cody will suddenly come in after you. The three of them will start talking about Nami, and Gustafa will tell everyone how much he misses her and wonders where she is right now. While they're talking, Carter comes in and asks for a drink. He overhears the others talking about Nami, and then casually makes a comment that he saw her a little while ago. Cody, Gustafa, and Patrick freak out, bombarding Carter with questions as to where and when he saw her. Carter, taken aback, tells them that it was a little while ago, and he saw her around here. The three of them decide to leave and look for her. Once they're gone, Carter comments on how odd that was, and Griffin asks you if you'll stay or not. Say no and you'll automatically leave the bar. Once you exit, you'll meet up with the other three outside, who have just found Nami!! 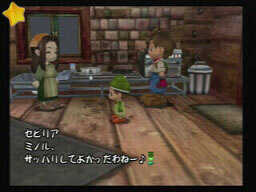 Everyone welcomes her back, and then Tim comes out of the inn to see what the commotion is about. He sees Nami and invites her to stay with him and his family at the Mitemi Inn again, telling her that her room is just as she left it. Nami decides to stay, and everyone leaves her alone, Gustafa saying that he'll have to write a new song just for this event, heh... You'll then walk up to Nami and talk to her. She'll tell you that it looks like she'll be staying here for a little while again, and you can either tell her that you're happy she's back (option 2) or that she should consider staying here forever (option 1). If you choose option 1, she'll be very happy. Characters Involved: Griffin and Muffy. This will only happen during chapter 5, and you cannot be married to Muffy. Enter the bar at a time when both Griffin and Muffy are there (which is almost any time of day, every day.) It's hard for Muffy to accept the fact that she's not young anymore, and still not married... something Griffin says cuts her so deeply that she makes up an excuse for leaving and rushes out of the bar, leaving you and Griffin inside, confused. Outside the bar, Muffy talks to herself and manages to calm herself down before re-entering. She apologizes for reacting so severly. This will only happen during the months of Fall or Winter of chapter 5, and you cannot be married to Celia. You must also be very good friends with Marlin. Exit the house at Vesta's farm at a time when Marlin is inside the other building. Marlin will exit the building and invite you for a drink over at Takakura's house. Well, Celia, who just happened to exit the house in time to hear Marlin say that, suddenly gets thrown in a bad mood by that and demands that Marlin pick some carrots for the dish she's cooking. Celia will then ramble to you about how men only think of themselves and their own fun and neglect their work, no matter how good or hard they worked when they were younger. She will then go back inside before Marlin brings her the carrot! When Marlin comes back with the carrot, he tells you that having a drink today is impossible, since Celia's in such a bad mood. He'll also comment on how Celia has been acting just like Vesta lately... Marlin will invite you to Takakura's house for a drink around 9PM. Charcters Involved: You, Marlin, Takakura. Exit your house around 6-9PM a day or two after the above scene. 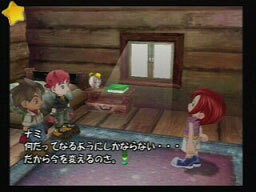 You'll see Marlin and Takakura talking outside Takakura's house, and Marlin will invite you to come in for a drink. Once inside, Marlin will say that when they are young, women are willing to listen to men and do as they're told, but when they get older, it's the other way around! He'll ask you about your wife: has she changed like that? If you tell Marlin that your wife has not changed and is still wonderful (option 1), Takakura will then speak up with his own thoughts on the matter.